Whittington: Victory For The People! 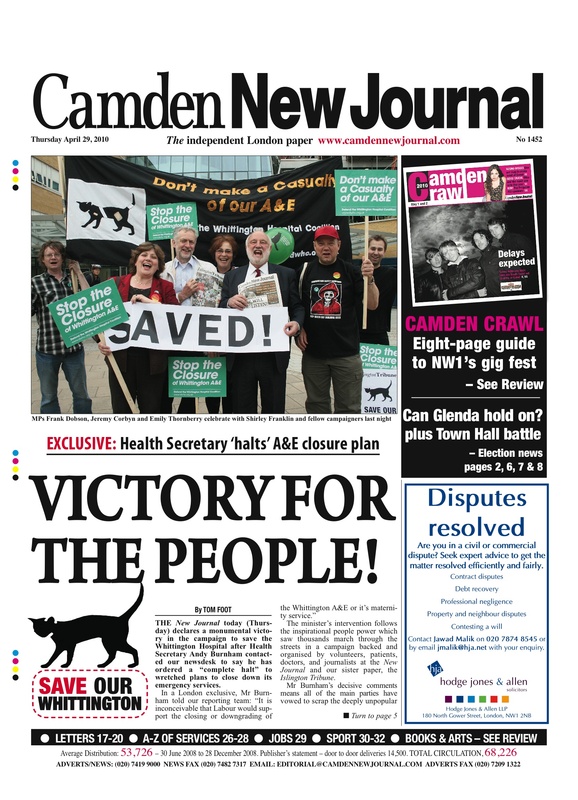 TODAY’S front page of the Camden New Journal is worth the wait, it will have a special place in the archives. It revealed first that Health Secretary Andy Burnham will scrap plans to close down the Whittington Hospital’s Accident and Emergency department. Journalist Tom Foot’s big London scoop means all of the political parties can now be held to to the promise that the service – and the maternity unit – in Archway will not be cut. No wonder after a story like that, a day of protest outside the hospital this morning had a more celebratory mood. Today’s front page will also be kept somewhere safe so that it can be retrieved if necessary, a weapon against any step towards a broken promise. The most cynical readers, conditioned by the healthy sceptism you find in the pages of all of north London’s newspapers, will of course remark on the timing of this rescue, that Mr Burnham’s call to New Journal HQ came with just a week to go to a General Election. But isn’t that what elections are about, a chance for us – and not the politicians – to forge the agenda. Every four or five years, we get the chance to make our demands as an electorate. In this case, we believed it was right to join calls to put this immense public service first and through publicity and protest it got to the top of the list. The 5,000 who marched through the streets agreed. On that day, Labour, Tories, Lib Dems and Greens protested together for the common good. The importance of today’s exclusive is that Mr Burnham’s call to the newsdesk puts the promise on record and only the bravest of future health secretaries, whatever the colour of their rosette, will risk another showdown with the Defend Whittington Hospital Coalition and the New Journal/Islington Tribune battle-bus by revisiting the wretched idea of dismantling the A&E. A line is now marked in the sand. We can now hold the country’s most senior politicians to account and as voters, residents, patients, doctors and journalists we will not let them wriggle away.